Getting an unexpected error with DESeq2. Also tried setting new rownames like rownames(dds) = 1:length(dds), but I still get this error. I've tried installing the binary for OSX and compiling source, and same result. I must be missing something obvious. Any ideas? What happens with DESeq(dds, minRep=Inf)? I’m not sure if I can figure out what’s going on because it doesn’t throw this error in our tests. I’ll take a look at the code, but may not find the issue. I’d say you can also just assess outlier by eye with a few example of peaks with large value of maxCooks in mcols(dds), rather than using the outlier replacement heuristic. Can you show mcols(dds) before you run DESeq()? Are there any additional columns there? Setting minRep=Inf also fixed the problem for me, and it does look like I had a few outliers in the post-DESeq dds. Can you send me the dds to maintainer(“DESeq2”) ? And I’ll try to hunt down the bug. Thank you, I was able to reproduce with v1.20. 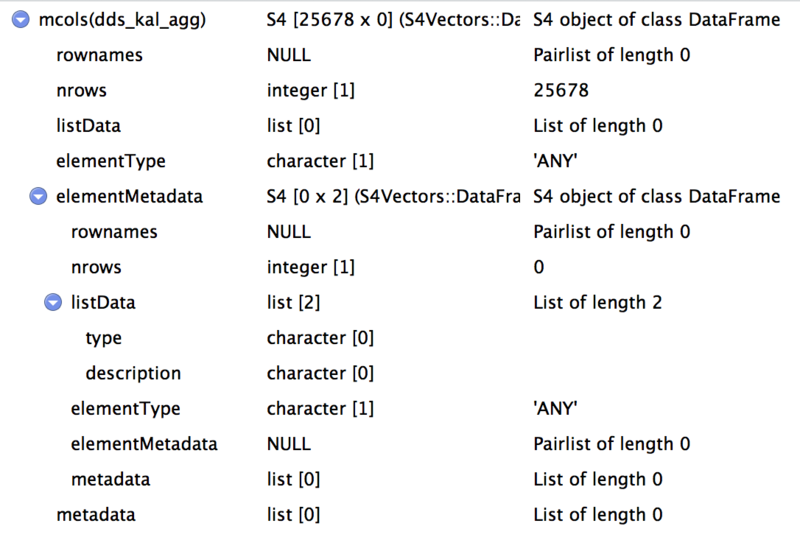 The problem is that you have duplicate columns of colData(dds), which breaks some code where replaceOutliers adds a column to colData(dds) and adds some metadata about that column. "Line" and "DESeqAnalysisID" columns both have duplicates. So a solution is to only have unique column names for colData(dds), which is probably a good idea anyway. I noticed that the error isn't thrown anway in the development version, which will be released in a few weeks as v1.22.